Beautiful property with swimming-pool situated in quiet location at a short distance from the small town of San Giustino. This property comprises an ancient villa and a farmhouse which have been skillfully restored and turned into 8 nice apartments and 3 bedrooms offering comfortable and tastefully furnished interiors. 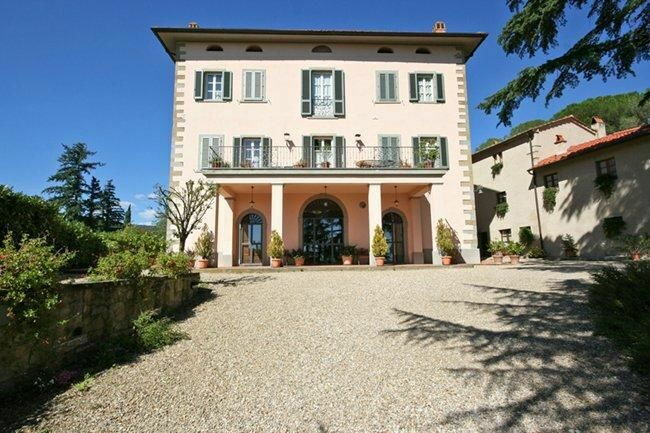 Villa Claudia is in ideal location to visit Arezzo and other beautiful art cities like Siena and Florence. All of the apartments are provided with telephone and wireless internet access. The apartments Claudia 1, 2, 3, 4, 5, 6, 9, 10 and 11 are in the main villa, while Claudia 7 and 8 are in the adjoining farmhouse. Distances: San Giustino with all kinds of shops 500 m away, Arezzo 15 km, Montevarchi 15 km, Florence (airport) 60 km away. At guests’ disposal: swimming-pool (12 x 6 m – maximum depth 1,5 m – open from 01/05 to 31/10), barbecue, telephone and wireless internet connection in each apartment. The property also offers a small 1-hectare park furnished with tables and chairs. Parking within the grounds. Extra services to be paid on site: baby bed (free of charge). Maid service available on request at € 30,- / per day. Breakfast service on request (€ 8,- / per person or € 6,- / per child). Wood for fireplaces available at € 25,- / per day. On request it is possible to hire an extra bed at € 25,- / per day or € 120,- / per week in high season and at € 20,- / per day or € 100,- / per week in mid and low season. Pets are allowed. 70 m2 1st floor: living-room (satellite TV) with dining area, ancient fireplace, double sofa-bed and kitchen corner (oven, freezer), double bedroom with fireplace, bathroom with shower (without window) This apartment is connected with Claudia 2 and these 2 units can be rented together for a total of 4-8 persons.